The Case for Trade Remains Overwhelming - Epoch Investment Partners, Inc.
International trade has moved to center stage in the U.S. political debate, with anti-trade tirades and protectionist rhetoric dominating stump speeches and media coverage. It is especially worrisome that opinion polls suggest that supporters of both parties believe trade agreements result in fewer jobs and lower wages. These developments raise three key questions: First, why does trade matter so much? Next, why has protectionism become such a prominent issue in 2016? And finally, what are the economic and market implications if the protectionists prevail? Regarding the first question, to understand why trade matters so much it is helpful to go all the way back to 1817 when the English economist David Ricardo first derived the Law of Comparative Advantage, which shows that free trade almost always benefits both parties. In a famous example, Ricardo pointed out that both Great Britain and Portugal would benefit if they exploited their comparative advantages, given that Portugal could produce wine cheaply, whereas Great Britain could produce cloth much more inexpensively. By selling cloth and buying wine, Great Britain obtains more of both, as does Portugal. The same holds true today, when countries, doing what they do best, produce more and exchange it for a greater amount of all other goods. We have previously written extensively on this topic; see, for example “A Really Bad Idea” from February 2009 (it explained why the burgeoning “Buy American” policy was a bad idea).1 However, to some (including a number of the presidential candidates), the notion that every country can benefit from trade may seem counterintuitive. After all, isn’t there always a “loser” for every “winner?” Isn’t trade a zero-sum game? Fortunately, the answer is no. According to the Law of Comparative Advantage every nation can, and does, win. To demonstrate the powerful gains that are available from trade, we work through an example at the end of this paper. It illustrates the Law of Comparative Advantage and demonstrates the profound and robust power of trade to deliver growth and prosperity, a lesson that too many commentators appear to have recently forgotten. It is fortunate though, that since 1945 there has existed within the U.S. a broad consensus in support of global economic integration as a force for peace and prosperity. As a result, U.S. exports have increased by 44 times (in real terms) and living standards have risen faster than almost any period in history. Further, globalization received a huge boost from 1989, with the fall of the Berlin Wall and the “Rise of the Rest,” especially China and the other BRICs. This turbocharging of the pace of globalization and international trade activity would have made Ricardo proud and reflected a type of global labor arbitrage that by now has largely run its course (at least in manufactured goods). It is an indisputable truth that international trade has been a key driver of improvements in our standard of living since WWII. To illustrate, the White House’s Council of Economic Advisors (CEA) believes median U.S. consumers have gained 29% of their purchasing power from trade.2 Looking around my living room that number feels about right; and it is a great summary statistic, demonstrating unequivocally why free trade still deserves our full-throated support. Concerning the second question, protectionism has become such a prominent issue in 2016 largely because the U.S. was caught off guard by the arrival of China onto the world trading scene, an event that was unprecedented in terms of its speed, scale and scope. During the post-WWII period the vast majority of international trade occurred between developed market economies, which typically possessed quite similar labor costs. Although U.S. imports from low-wage emerging markets have historically been relatively modest, this changed dramatically in the late–1990s as China prepared to join the WTO. Recent opinion polls have made it clear that for trade to receive broad public backing it is crucial that dislocated workers receive compensation and support. Unfortunately, trade adjustment assistance programs have been woefully inadequate, even though the costs of credible programs would represent only a small percentage of the total gains from trade. For example, in the case of the Trans-Pacific Partnership, the Peterson Institute for International Economics (PIIE) estimates it would only take 6% of the gains from trade expected to accrue to the U.S. to adequately compensate dislocated workers. Given this powerful arithmetic, just about everyone now agrees that those hurt by free trade need to be provided with more help, ideally from a menu that includes vocational training programs, job search and relocation assistance, and income supplements. In principle, the winners should be able to compensate the losers so that everyone gains. In practice this has proved difficult due to political and budget constraints. The shock caused by China’s emergence has clearly exposed fault lines in America’s economy and created a strong political anti-trade backlash. With that in mind, we now turn to the third question raised above, specifically, what are the economic and market implications if protectionists begin to turn back the globalization clock. Well, for a start, it appears that this process has already begun. 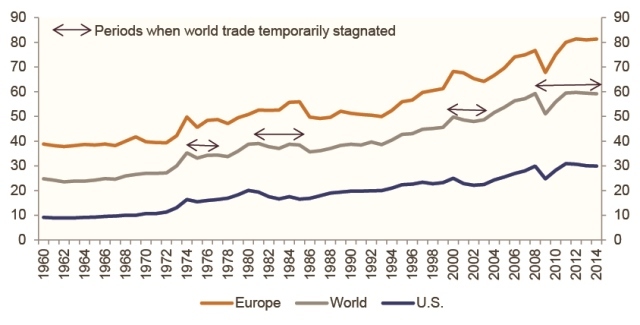 To illustrate, during the last eight years the proliferation of protectionist policies globally has been associated with the longest period of trade stagnation experienced since WWII. Further, it has already become increasingly difficult to negotiate and ratify new trade agreements, which makes it likely that trade growth will continue to stagnate well into the 2020s. These developments also raise the risk of trade wars and skirmishes, especially with China. It seems reasonable to expect that trade disputes will occur more frequently in coming years, which raises the question of how markets would react to an all-out trade war. An extreme case could involve a replay of Smoot-Hawley and the unwinding of all existing trade agreements. In such a scenario, a global recession would likely occur almost immediately, with 4 million jobs lost in the U.S. alone. Further, in an extreme outcome in which all trade would come to a halt, median U.S. consumers would lose the 29% of their purchasing power that is estimated to come from trade. With the stroke of a pen an enormous amount of value would be destroyed, much like what occurred in the early 1930s, making us all extremely worse off. Not a terribly cheery scenario, but a realistic one. Moreover, even the anticipation of a trade war would cause global stock markets to sink. Among U.S. equities, a trade war would: hurt international companies more than domestically oriented firms; damage large caps relative to small caps; afflict sectors like technology, which depend upon intellectual property rights; and strike a deep blow to companies that depend upon global supply chains. Most international equity markets would perform even worse, especially those of countries with current account surpluses that need to, in effect, import demand. Even if events don’t deteriorate that dramatically, it is clear that the forces of globalization are sputtering. This paper’s goal is to demonstrate why the burgeoning protectionist rhetoric, although understandable and often heartfelt, reflects faulty logic and bad economics. In our view, stepping back from globalization would actually worsen unemployment in the U.S., lower living standards, and dampen future economic growth rates. Avoiding this fate requires that policy makers provide more help for dislocated workers, push back against protectionist pressures and implement policies to further liberalize trade, especially in services. A tall order indeed, but one that deserves the full focus and attention of the next administration. The remainder of this paper explores the issues sketched above in more detail, finishing with an example of comparative advantage that demonstrates the powerful gains that are available through trade. In the current election campaign, all leading candidates have adopted protectionist stances and promised not to ratify the principal free-trade initiative of this period: the Trans-Pacific Partnership (TPP). Further, the Trans-Atlantic Trade and Investment Partnership (TTIP) with Europe appears equally challenged by the misguided, anti-trade tone that has featured prominently in the race for the presidency. Regardless of the rhetoric, it is a myth that Americans have turned decisively against free trade policies (Figure 1). The reality is that public opinion has long been muddled, both supportive and skeptical. For example, Ross Perot and Pat Buchanan campaigned with aggressively anti-trade stances in the 1990s. Perot’s 1992 campaign, warning about the “giant sucking sound” of jobs moving to Mexico, was particularly successful. He won 19% of the popular vote; the strongest third party showing since 1912. Although a slight majority of Americans appear to support free trade, they are ambivalent regarding its impact on the economy and, most strikingly, believe that trade agreements, on balance, lead to job losses and lower wages (Figure 2). 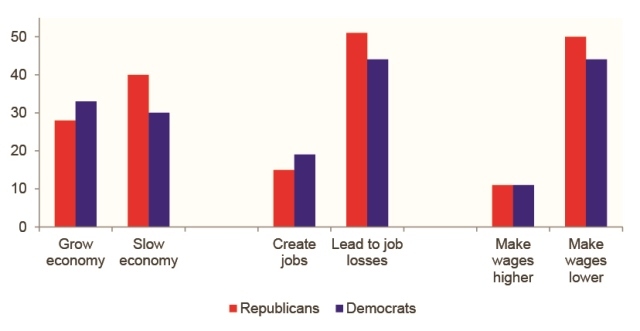 Further, and in contrast to the strident partisan divide on many other issues, supporters of the two parties express conspicuously similar views on trade. Overall support for free trade in the U.S. is actually slightly higher now than it was fifteen years ago. 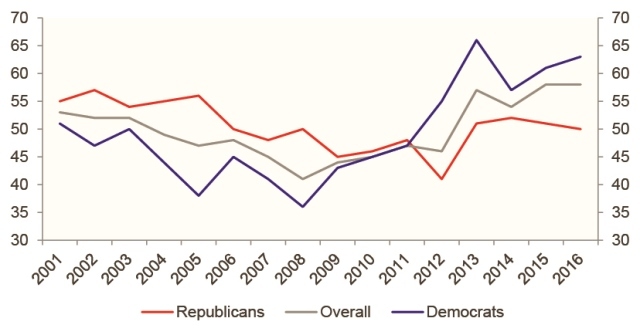 Further, the difference between the two parties is not huge and actually switched sides five years ago. Respondents don’t have strong views regarding the impact on economic growth, but tend to believe that trade agreements lead to job losses and lower wages. Again, this survey found only modest differences between supporters of the two parties. Even if fears of job losses and lower wages are genuine, they cannot be used to justify the faulty logic and bad economics of some campaign pledges. To illustrate, one candidate has threatened to slap tariffs of 35% and 45% on imports from Mexico and China, respectively. The American Action Forum estimates this would be equivalent to a giant tax hike on U.S. consumers (to the tune of $250bn, including $18bn on cellphones and $15bn on clothing). Further, according to Moody’s Analytics, it would push China and Mexico into recession and, if they chose to retaliate (which they almost certainly would), the U.S. would also fall into a trade-induced downturn (with up to 4 million Americans losing their jobs). Catchy sound-bites rarely translate into good policy and this is a galling example of an inadequately thought out, lose-lose proposal. Although the populist rhetoric may be excessive, globalization has certainly not lifted all boats and few deny any longer that the underlying grievances are real. In particular, since 1999, the flood of imports from China has resulted in significant dislocations in the U.S. and has been a major reason so many Americans now associate trade with job losses and lower wages. Further, according to a recent Pew survey, a majority of Americans view the U.S. trade deficit with China as a very serious problem. The reasons behind these beliefs and grievances are explored in the following section. Between 1984 and 1998, employment in the U.S. manufacturing sector held quite steady, in the 17 to 18 million range, but then plummeted toward 12 million over the following decade. In fact, manufacturing jobs in the U.S. declined every single year from 1998 to 2009. 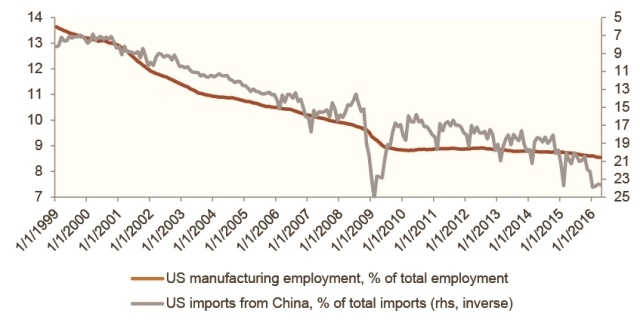 This seismic shift has attracted a great deal of attention, especially given that the decline in manufacturing employment coincided with the surge in U.S. imports from China (Figure 3). The acceleration in imports, in turn, reflected the run-up to China being granted Permanent Normal Trade Relations status by the U.S. in 2000 and then joining the World Trade Organization in 2001. Between 1999 and 2009, U.S. manufacturing employment (as a percent of total jobs) declined from 13.6% to 8.9%, while U.S. imports from China (as a percent of total imports) more than tripled. U.S. workers, manufacturers and policy makers were caught off guard by the arrival of China onto the world trading scene because its speed, scale and scope were unprecedented. During the post-WWII period the vast majority of international trade occurred between developed market economies, which typically possessed quite similar labor costs. Although U.S. imports from low-wage emerging markets have historically been relatively modest, this changed dramatically sixteen years ago (Figure 4). Prior to 2000, the U.S. traded primarily with other high-wage developed market economies. However, during the last sixteen years, exports from emerging market economies have risen dramatically. Bursting onto the world trade scene did not happen overnight. It involved a lot of preparation, including dramatic reductions in tariffs during the 1990s and the 2000s (Figure 5). However, China and other emerging markets still possess much higher tariff rates than the U.S. and other developed countries. For example, according to the White House’s Council of Economic Advisors, “U.S. businesses face an average tariff hurdle of 6.8%, in addition to numerous non-tariff barriers … [while] almost 70% of U.S. imports crossed our borders duty-free.” Further, China is often criticized for keeping in place numerous non-tariff barriers, as well as state aid and other implicit subsidies for exporters, which many commentators argue dramatically tilts the playing field in its favor. 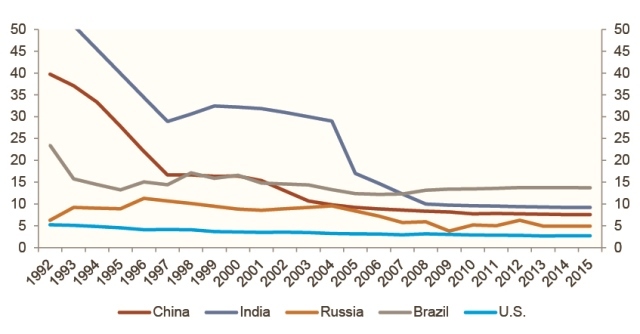 Figure 5: Average Percent Tariff Rate for China, Other BRICs and the U.S. Since the 1990s, average tariff rates have declined markedly for many emerging markets. However, they are still well above those for the U.S. and other developed markets. Further, non-tariff barriers remain significant in many emerging markets. 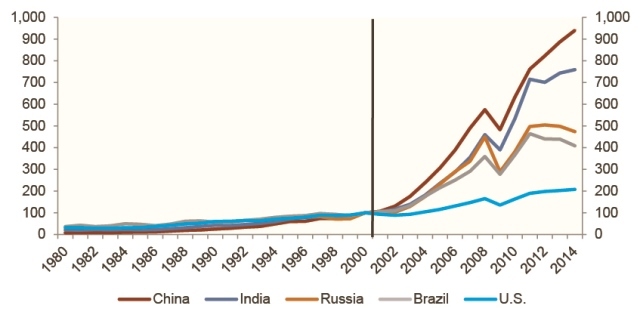 Since 2000, China has been one of the main beneficiaries of the boom in world trade. Its trade surplus with the U.S. is huge, with the percentage of America’s imports coming from China quintupling over the last two decades (to 23.6% in 2016), while U.S. exporters to China have enjoyed much less success. One consequence is that workers in China (and other emerging markets) are much more likely to believe trade is good, creates jobs and raises wages than are their counterparts in the U.S. (Figure 6). Respondents in China strongly believe that trade is good, creates jobs and raises wages. This is similar to the view held overall in emerging markets, but very different than attitudes in the U.S., where less than 20% agree that trade creates jobs and raises wages. A series of articles written by economists at MIT and other universities4 provides the most reliable and compelling estimates of the negative impact of increasing import competition, especially from China, on U.S. labor markets from 1999–2011. 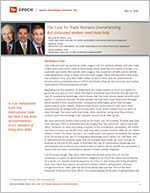 By examining and contrasting the experience of local labor markets across America that have different levels of exposure to competition from imports, the articles reach two conclusions that are crucial to the ongoing debate on trade. First, they estimate that rising imports from China resulted in the loss of 2.4 million U.S. jobs, including 1.0 million in the manufacturing sector. This latter number represents almost 20% of the 5.5 million manufacturing jobs lost during this period, with the global shift toward services accounting for another 15% and the remaining 65% due to productivity gains, including the introduction of new technologies. Second, the job losses from free trade are more concentrated and longer-lasting than had previously been assumed by economists and policy makers. Mobility responses (i.e., people moving to where new jobs are) and adjustments are remarkably slow, with wages and labor force participation rates remaining depressed and unemployment rates staying elevated for at least a full decade after the China trade shock commenced. This is especially true for workers without a college education. That the mobility responses to the import shock have been much slower and less complete, even after ten years, is particularly startling and unsettling. In large part, the slow pace of adjustment reflects the speed and scale of China’s rise: to illustrate, its share of world manufacturing exports soared from 2% in 1991 to 19% by 2013. Further, workers seem less willing to switch jobs or move states than in the past (possibly due to higher home ownership levels). The evidence suggests that people who lose high-paying jobs in manufacturing can often find alternative work — but typically at a much lower wage in the service sector. In principle, the winners5 should be able to compensate the losers so that everyone gains. In practice this has proved difficult. Those hurt by free trade should be provided with greater support, ideally from a menu that includes vocational training programs, job search and relocation assistance, and income supplements. According to the Peterson Institute for International Economics (PIIE), trade adjustment assistance programs to support dislocated workers have, unfortunately, been woefully inadequate, even though the costs of such programs would represent only a small percentage (a typical estimate is 6%) of the total gains from trade. This is troublesome for several reasons, including that the lack of adequate support for hurt workers has been associated with increased calls for protectionist measures. Such policies discourage imports and distort trade, and ultimately are much more expensive. For example, the PIIE estimates that protectionist measures implemented in 2009 – 2010 against tire imports from China cost American consumers $900,000 per job saved. Another unfortunate consequence is that it has become increasingly difficult to negotiate and ratify new trade agreements. This is particularly worrisome, as trade growth has already stagnated (Figure 7), with no signs of improvement on the horizon. The shock caused by China’s emergence has exposed fault lines in America’s economy and created a strong political anti-trade backlash. The next section of this paper explores three ways in which the recent protectionist lurch is likely to damage prospects for global trade growth; that is, unless the right set of policies is soon put in place. Trade increased from 25% of GDP in 1960 to 60% today, but Trade has stagnated since 2008. Although there have been three other periods of trade stagnation (corresponding to the OPEC shock, the Volker recession and the tech boom’s collapse), the current episode is by far the longest. Trade and Tribulation: Has a Protectionist Moment Finally Arrived? The post-WWII trade boom was turbo-charged by three factors: U.S. global leadership; the GATT and, since 1995, the WTO; and containerization.6 Unfortunately, U.S. leadership can no longer be counted on; the WTO has been marginalized, especially given the failure of the Doha round; and almost all the potential gains have already been squeezed out of containerization. It is then no wonder that globalization is sputtering. Some commentators warn that we could have a replay of the disastrous Smoot-Hawley Tariff Act of 1930, which reduced the volume of U.S. trade by over 40% by 1934. As Thomas Friedman put it, “Protectionism did not cause the Great Depression, but it sure helped to make it ‘Great.” Smoot-Hawley certainly made a bad situation worse and just about everyone suffered as a result. Luckily though, generations of policy makers have drawn the correct lessons from the infamous Smoot-Hawley Act, specifically: tariffs and non-tariff barriers should be reduced wherever possible; trade wars are disastrous and must be avoided; and the best way to achieve these goals is through multilateral negotiations. The good news is that this suggests Smoot-Hawley 2.0 is highly unlikely. The bad news is that three other types of policy mistakes seem probable in the current environment, each of which may constitute a considerable headwind for global trade growth over the coming decade. First, multilateral negotiations have suffered a number of serious setbacks during the last couple years, including the inability to complete the Doha round (in spite of over 12 years of negotiations) and an increasing likelihood that the TPP (Trans-Pacific Partnership) will never be ratified (it is opposed by all major candidates for the presidency). Further, the TTIP (Transatlantic Trade and Investment Partnership) negotiations between the U.S. and Europe face serious challenges. The process was launched in July 2013, but has progressed slowly as opposition on both sides of the Atlantic has grown. The 13th round of formal talks began on April 25, 2016 in New York, but there remain vast gaps between the two sides’ positions on key issues. To illustrate, German respondents are especially concerned about the negative impact the TTIP would have on labor market conditions and workers’ rights, and their support has declined markedly since early 2014 (Figure 8). Americans also oppose the TTIP, in spite of their view that it would be marginally positive for domestic economic growth but, consistent with other survey results, they fear it would have a negative impact on employment and wages. Given the breakdown of the Doha round, and the likely failures of TPP and TIPP, it seems reasonable to expect trade stagnation to continue well into the 2020s. According to the PIIE, the absence of liberalization and the eruption of micro-protection measures have been major contributors to the lack of trade growth witnessed during recent years. Respondents in Germany were initially strongly in favor, but their support has declined consistently and dramatically over the last two years. The second type of policy mistake that seems probable in the current environment attracts fewer headlines, but involves a more insidious deglobalization, as politicians give up on further attempts to liberalize trade and instead succumb to piecemeal protectionism. This trend has accelerated in the last eight years and represents a type of “death by a thousand cuts.” Such micro-protections are individually small but collectively deadly, and often fly under the radar, skirting the letter and intent of WTO rules. According to Global Trade Alert, since 2008 more than 5,500 protectionist and trade distorting measures have been introduced around the world. The most common non-tariff measures include: state aid, export subsidies, import quotas, local content requirements, anti-dumping measures and countervailing duties. The cumulative impact of thousands of opaque measures designed to distort trade represents a gradual slide into covert protectionism, and its effects will be felt incrementally over years to come. Next, the third type of potential policy error concerns trade spats and skirmishes, which distort trade, penalize consumers, and run the risk of sparking a broader trade war. One dispute was in fact just settled a couple of weeks ago, on April 14, when China agreed to eliminate a wide range of subsidies for exporters in seven broad sectors, following a U.S. complaint filed with the WTO in February 2015. Additionally, there have been several other high profile disputes since China joined the WTO in 2001, affecting the steel, tire and other industries. Trade disputes will likely occur more frequently in coming years, with a rising risk that skirmishes broaden into an all-out trade war. Even if we manage to avoid a trade war, given the failure of the Doha round, the challenges facing TPP and TIPP, as well as the proliferation of micro-protectionism, it seems probable that trade growth stagnation will continue through at least the end of this decade. Avoiding this fate requires that U.S policy makers take several actions, including: providing more help for dislocated workers; pushing back against protectionist pressures; and implementing policies to further liberalize trade, especially regarding intellectual property rights, regulatory standards and exportable services. On this last point, further liberalizing trade in services is particularly important as the U.S. already runs a sizeable trade surplus in this sector ($220 billion in 2015) and is the global leader in services exports (including insurance, financial services, marketing, legal services, IT, engineering and health care). Further, the PIIE believes this is where the greatest potential for expanding trade lies and that U.S. exports of services could quadruple from 5% to 20% of sales. PIIE also notes that China has significant barriers to trade and investment in these areas, so persuading Beijing to open up its service sector could create tremendous benefits for the U.S. economy and significantly reduce the bilateral trade deficit. This view is also emphasized by the Council of Economic Advisors (CEA), which notes that American companies face significant trade barriers in 14 of 18 different service sectors. That is a pretty impressive gain from trade and, given its importance, the last section of this paper provides a stylized example to demonstrate how the gains from trade are driven by comparative advantage. This rather straightforward example provides a profound and robust demonstration of the power of trade to deliver growth and prosperity, a lesson that too many politicians and commentators appear to have recently forgotten. We have known for centuries that free trade almost always benefits both parties. The English economist David Ricardo pointed out almost two hundred years ago that both Great Britain and Portugal would benefit if they exploited their comparative advantages. Portugal could produce wine cheaply, whereas Great Britain could produce cloth much more cheaply than wine. By selling cloth and buying wine, Great Britain obtains more of both, as does Portugal. The same holds true today, when countries, doing what they do best, produce more and exchange it for more of all other goods. To some (including a number of the presidential candidates), the notion that every country can benefit from trade may seem counterintuitive. After all, isn’t there always a “loser” for every “winner”? Isn’t trade a zero-sum game? Fortunately, the answer is no. According to the Law of Comparative Advantage, every nation can win. Developed in 1817, the Law of Comparative Advantage states the following: whether or not one of two countries is absolutely more efficient in the production of every good than is the other, if each specializes in the products in which it has a comparative advantage (greatest relative efficiency), trade will be mutually profitable to both countries. Real wages of productive factors will rise in both places (this corollary also helps explain why unskilled workers, the less productive factor in the U.S., tend to be opposed to trade with China). An ill-designed prohibitive tariff, far from helping the productive factor of production, will instead reduce its real wage by making imports more expensive and by making the world less productive through eliminating the efficiency inherent in the best pattern of specialization and division of labor. We have previously written extensively on this topic; see, for example “A Really Bad Idea” from February 2009 (it explained why the burgeoning “Buy American” policy was a bad idea). However, its importance cannot be overstated, especially given how prevalent anti-trade rhetoric currently is, so let’s take another look at this law in action. Imagine two countries, A and B, and a world that desires two goods: food and clothing. For simplicity, let us also assume both countries desire food and clothing in equal amounts. Let us further assume Country A is a more mature country with a higher overall standard of living and with labor productivity that is greater than B for each good under production. In Figure 9, we show that Country A takes one day to make one unit of food and two days to make one unit of clothing. Country B, on the other hand, is much less productive in each instance, taking three days to produce a unit of food and four days to produce a unit of clothing. So, if both nations desire an equal amount of food and clothing, what might production look like after 100 days of effort in both countries if they are not yet allowed to trade with each other? Figure 10 discloses the outcomes. 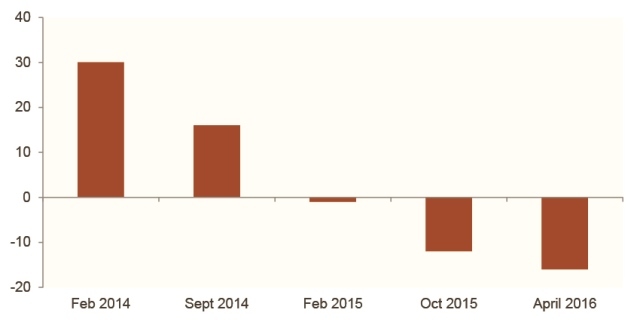 Country A will spend 33 1/3 days on food and 66 2/3 days on clothing. In this way, it will have 33 1/3 units of food and 33 1/3 units of clothing when the 100 days are over. Let’s compare this to Country B. Whereas Country A produces approximately 66 units of food and clothing in equal amounts over 100 days, the best that B can do is produce a total of 28 units, 14 units each of food and clothing. In Country B, just over 42 days is spent making 14 units of food and just under 58 days is spent making 14 units of clothing. Under this scenario, the two countries together produce 94 units of the two items with Country A contributing 70% of the total. We assume Country A is more efficient in the production of both goods. We also assume that both countries desire food and clothing in equal amounts. The lack of trade between the two countries rules out the possibility of specialization in production. In this case, the total output of food and clothing amounts to 94 units. So far, in this example, neither country has put the Law of Comparative Advantage into effect. That is, they have not optimized their production strategies or traded with each other yet. On the surface, it would appear that A has nothing to gain by trading with B given that A’s absolute productivity is superior in both products. However, what we now show is that what matters is not absolute productivity, but relative productivity (i.e., comparative advantage). The key is to envision A and B as one combined country rather than two separate entities. In this way, we can reconfigure the days available for production in a far more efficient manner (a little algebra will solve for the optimum solution rather than a trial and error approach). For example, if A spends 50 days making food and the other 50 days making clothing, it now has 50 units of food but only 25 units of clothing. If B spends no days on food and all of its days on clothing, it can make 25 units of clothing. In Figure 11, we see the results of this reallocation. When each country produces goods in accordance with its relative productivity (i.e. comparative advantage), the result is 100 units of food and clothing, 6.4% more than in the first scenario. Now, if we allow trade to occur unfettered, these six additional units will be split between A and B in some fashion. The way the surplus of six units is apportioned will depend upon the bargaining power and capabilities of the two countries.8 Since A is just over twice as productive as B (66 units ÷ 28 units), a reasonable split might be 4 units to A and 2 units to B. Here, it is important to note that both countries have won. According to Figure 12, A now has 70 units (as opposed to 66 from the first example) and B has 30 units (as opposed to 28). This is the Law of Comparative Advantage in action. It is powerful, it is good for all participating nations, and it proves that the process of free trade can make every country a winner. And now for an important caveat. It is true that the scenario presented above represents a perfect system. In an imperfect system, the labor transfer in Country B might reveal some inefficiencies that would slightly lessen the asserted benefits. In other words, if Country B shifts all its energy into clothing production, the food workers in Country B may end up becoming unemployed if their talents cannot be easily transferred to the clothing industry. If we introduce this sort of “friction” into the model, perhaps our surplus of food and clothing would be less. A surplus itself, however, would still exist and the guiding principles of relative productivity and comparative advantage would still apply. While every sector and every person may not benefit in every country, the nation as a whole would benefit and should be able to re-train, re-educate, and provide broader income security programs for displaced workers. In this example, trading has allowed the countries to obtain a more efficient outcome. Country B focuses exclusively on producing clothing (for which it has comparative advantage), allowing total production to increase by 6.4% from from 94 to 100 units. This last point, the imperative of helping displaced workers, is one of this paper’s key points. With globalization, there will always be dislocated workers and they will require assistance if trade is to continue enjoying popular support. Unfortunately, such benefits have been woefully inadequate in the U.S., even though their costs would represent only a small percentage of the total gains from trade. This is truly regrettable and has resulted in increasingly shrill calls for protectionist measures. To illustrate, and as discussed earlier, it has been estimated that it would only take 6% of the gains from the TPP trade initiative to adequately compensate dislocated workers. In the context of the above example demonstrating the power of comparative advantage, this implies that output net of compensation costs would increase from 94 units to something like 99.64 units (just shy of the 100 units in Figure 12). Gains remain significant and a decision to refrain from trade would constitute an indefensible policy error. Anti-trade sentiment has featured prominently in the current election campaign, suggesting that trade disputes will likely occur more frequently in coming years. In an extreme scenario, a replay of Smoot-Hawley and the unwinding of existing trade agreements would be analogous to moving back from Figure 12 to Figure 10, with output declining from 100 to 94. In the real world, the result would be more extreme with median U.S. consumers losing an estimated 29% of their purchasing power. It is imperative that politicians and policy makers ensure we avoid such a disastrous outcome over coming years. The two countries now produce in proportion to their comparative advantage and both are significantly better off than they were in the absence of trade. 3. The impact of productivity and technology on employment is examined by: McKinsey, 2012, “Manufacturing the Future”; Frey and Osborne, Oxford University, 2013, “The Future of Employment: How susceptible are jobs to computerization?”; and Baily and Bosworth, Journal of Economic Perspectives, 2014, “U.S. Manufacturing: Understanding its past and its potential future.” Productivity growth has been especially strong in durable goods manufacturing, particularly in the Computers and Electronic Products sector (where productivity growth has averaged 9.7% since 1987), fueled by remarkable technological advances. Consequently, this sector experienced the largest decline in employment, although all manufacturing sectors have been negatively affected. 4. See “The China Syndrome: Local Labor Market Effects of Import Competition in the U.S.,” American Economic Review, 2013; “Import Competition and the Great U.S. Employment Sag of the 2000s,” Journal of Labor Economics, 2016; “The Surprisingly Swift Decline of U.S. Manufacturing Employment,” American Economic Review, forthcoming; and “The China Shock: Learning from Labor Market Adjustments to Large Changes in Trade,” unpublished, 2016. 5. For example, winners from trade with China would include U.S. consumers, as well as U.S. exporters of goods (e.g., in the aerospace industry) and services (e.g., financial, education, and construction and engineering). 6. Uniform metal containers were invented by Malcom McLean, an American trucking magnate, in 1956 and are estimated to have cut the cost of seaborne trade by over 90% versus loose-cargo stevedoring. To illustrate, in the 1960s containerization resulted in port labor productivity increasing seventeen times, with insurance costs declining by 83%. According to The Economist, containers have boosted globalization more than all trade agreements in the past 50 years put together. Not bad for a simple box. 8. However, what is crucial is that each country is allotted a sufficient proportion of the gains from trade that it remains better off net of the costs of compensating dislocated workers (which, for example, PIIE estimates to be 6% of the gains to the U.S. from the TPP).